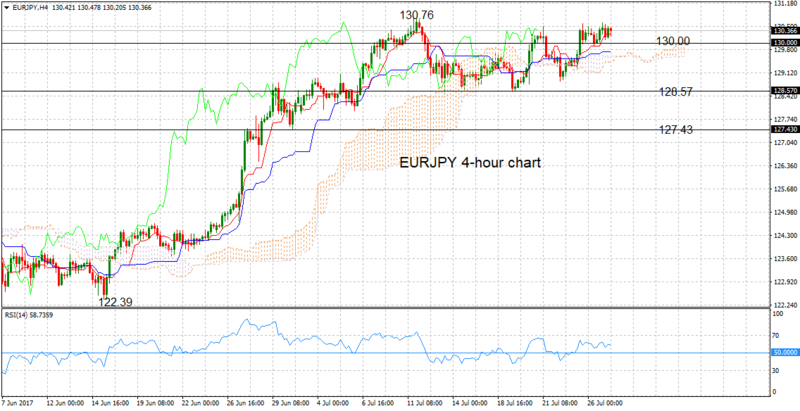 EURJPY is neutral on the 4-hour chart and has been consolidating around the key psychological level at 130.00. After hitting a more-than one-year high of 130.76 on July 11, there was a slight pullback in prices since the market reached overbought conditions, as was indicated by the RSI rising to 70. Upside momentum has weakened and a neutral phase is expected in the near term. Any corrective move lower would likely find support at 130.00. This is considered to be an important level since it has held as support in the past couple of days. Further weakness below this level may see EURJPY slip towards 128.57 (July 19 low). A fall from here would start to increase downside pressure as the market would be below the Ichimoku cloud. A break from here would target 127.43 (June 30 low). Looking at the bigger picture, the uptrend that started from the June 15 low of 122.39 to the July 11 high of 130.76 is still intact. There are no signs of a reversal in the uptrend yet. The risk is to the upside based on the bullish market structure on the daily chart. The Tenkan-sen line is above the Kijun-sen line and the market is above the Ichimoku cloud. Meanwhile, RSI remains above 50 in bullish territory. A successful break above the 130.76 high would open the way towards the next significant high of 132.00 that was reached in January 2016. Such a move would strengthen the medium-term bullish bias.